alaTest has collected and analyzed 53 reviews of Panasonic HX-DC3. The average rating for this product is 3.9/5, compared to an average rating of 4.0/5 for other Camcorders for all reviews. Reviewers really like the image quality and size. The price and portability also get good reviews. Many are critical about the color and memory. We analyzed user and expert ratings, product age and more factors. 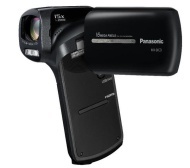 Compared to other Camcorders the Panasonic HX-DC3 is awarded an overall alaScore™ of 85/100 = Very good quality. alaTest has collected and analyzed 34 user reviews of Panasonic HX-DC3 from Amazon.co.uk. The average user rating for this product is 4.2/5, compared to an average user rating of 4.0/5 for other Camcorders on Amazon.co.uk. Opinions about the image quality and size are generally positive. The price and portability are also mentioned favorably, but there are some less positive reviews about the color and durability. alaTest has collected and analyzed 8 user reviews of Panasonic HX-DC3 from Amazon.com. The average user rating for this product is 4.0/5, compared to an average user rating of 3.9/5 for other Camcorders on Amazon.com. People really like the image quality and price. The usability and portability also get good reviews, but there are some negative views about the battery. Panasonic's HX-DC3 provides a decent optical zoom and manual settings for a very keen price. Digital zooms artificially blow up the image to achieve their effect, so reduce resolution, whereas an optical zoom preserves this. You will be able to zoom into the subject without ugly blockiness appearing. Could have come with some sort of strap to steady the camera. No internal memory.